The specific function of the parotid gland is to produce saliva to lubricate the oral cavity, and to aid chewing and swallowing food. 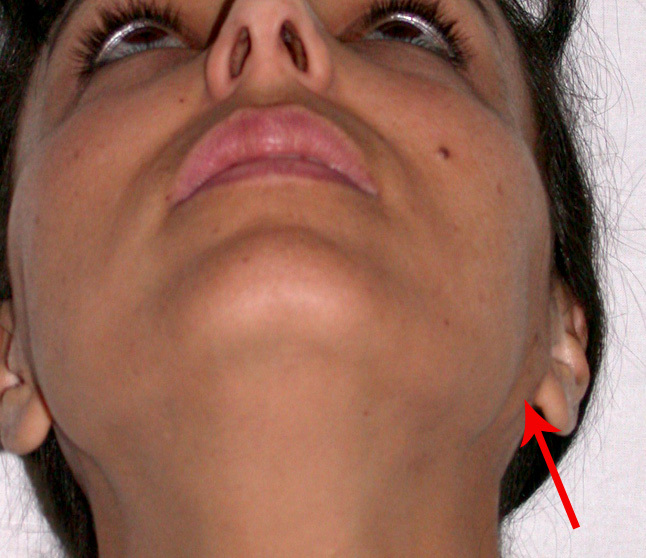 Inside the parotid gland, the facial nerve divides into several tiny branches, forming a network. The facial nerve also innervates the mimetic muscles of the face, so its lesioning leads to paralysis of the face. Thus, any surgery of this organ is considered particularly delicate. 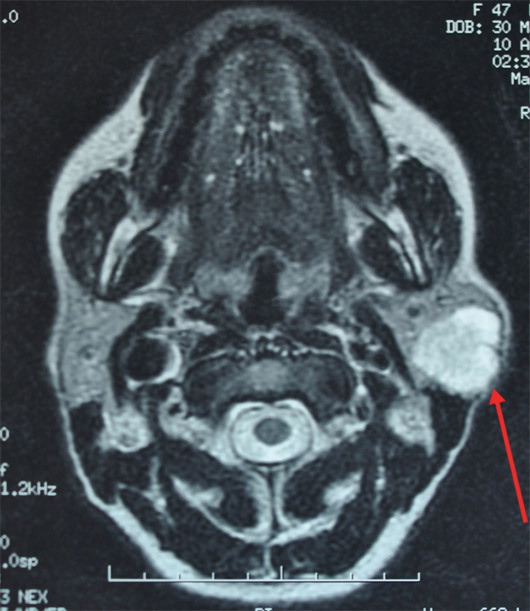 The parotid gland may be affected by numerous pathological processes that need to be treated surgically, among which the most frequent is the development of a benign tumour: a pleomorphic adenoma. Surgical excision of a pleomorphic adenoma is essential because, over time, it may reach a large size and transform into a malignant variant. Using an operative microscope minimises the possibility of relapse and helps to ensure conservation of the facial nerve and its branches. The precise removal of the lesion and sparing the tiny facial nerve branches are the goals of surgery; other details ensure an optimal result. 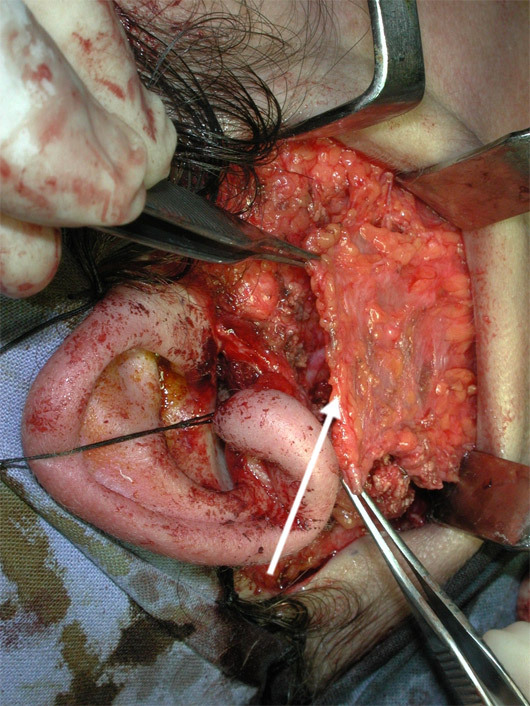 maintenance of the parotid gland itself (this is a healthy organ that does not need to be removed) and the parotid fascia, avoiding hollowing of the operated region. 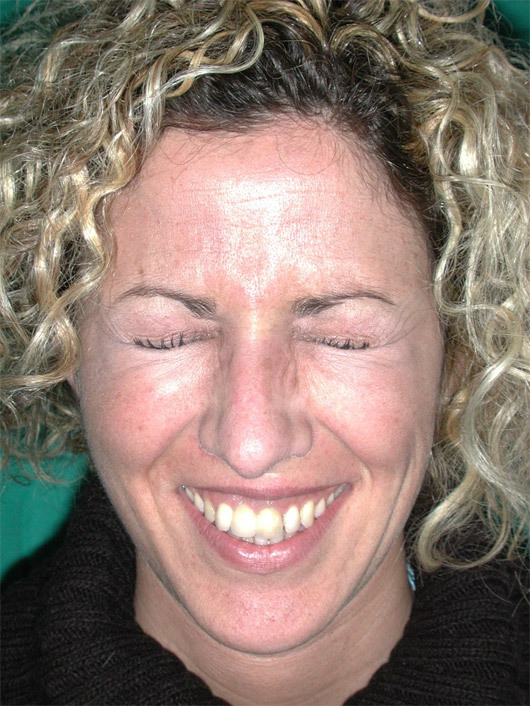 maintenance of the parotid and parotid fascia to prevent Frey syndrome (redness and sweating of the cheek during eating). 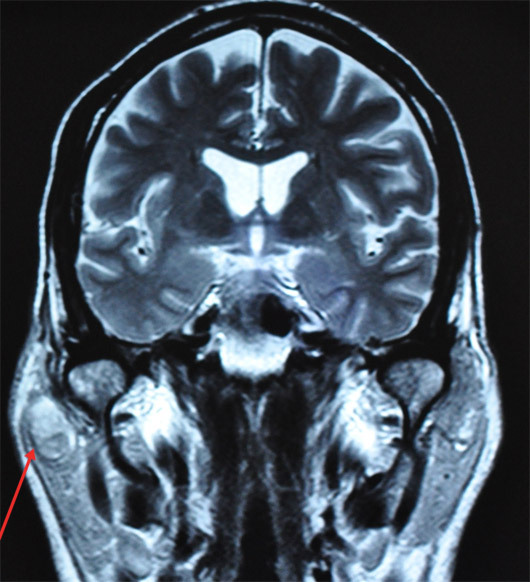 Patient with pleomorphic adenoma of the left parotid gland (arrows). Surgical details, as a face-lifting incision, use of an operating microscope to spare the facial nerve, and transposition of a temporalis fascia flap, allow maintaining full aesthetics and functionality in the operated region. 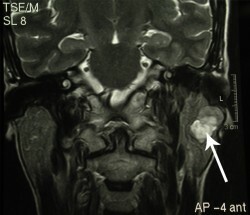 Fine branches (arrows) of the facial nerve shown at the end of lesion removal. 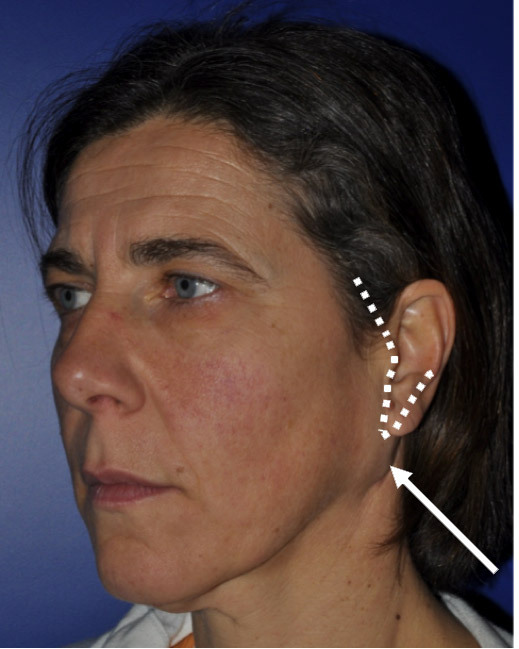 The thin parotid fascia and the underlying superficial musculoaponeurotic system (SMAS) are held with forceps so as to transpose them at the end of surgery to prevent the onset of Frey syndrome. 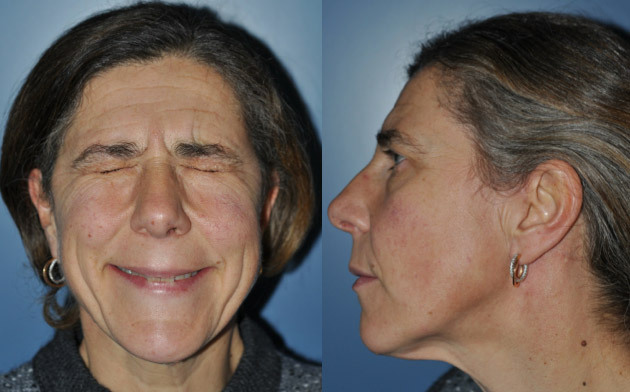 Complete maintenance of mimic and natural facial expressions after surgery. 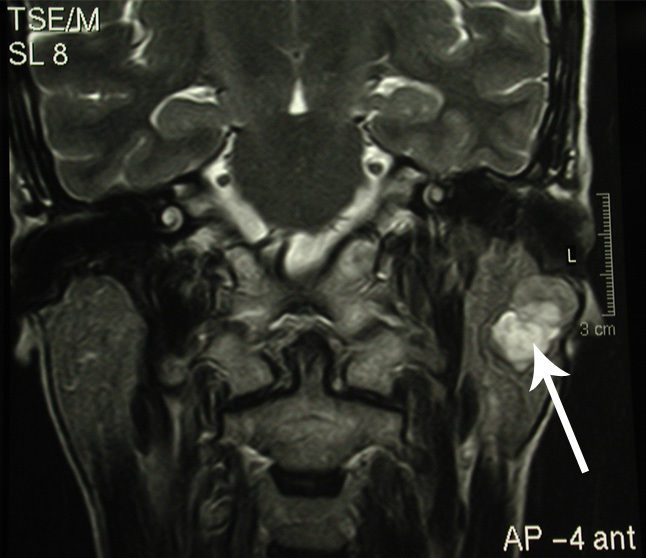 MR image shows a giant pleomorphic adenoma (~5 cm in diameter) of the left parotid. The surgical incision line corresponds to that used in face lifting. This allows keeping the scar well hidden. 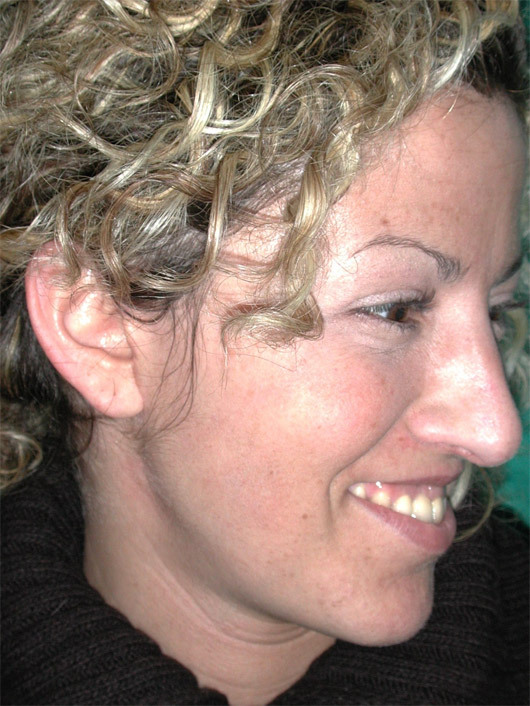 Despite the considerable size of the lesion removed, the chosen surgical technique made it possible to completely camouflage the scar, to avoid Frey syndrome, to maintain the sensitivity of the ear lobe, and also to retain the finest mimic facial movements.